I love burgers. All kinds of burgers. Teva Deli recently came out with really good ones. They’ve been making different burgers for a while now, but the new ones that just came out taste less healthy. Not that healthy isn’t a good thing – it is – it’s just that they aren’t all that burgerish. They really do taste great, but they are a bit on the expensive side. When I’m in a pinch, I’m happy to use Teva Deli’s burgers. 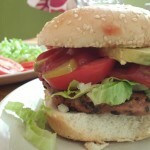 I like making my own black bean burgers. 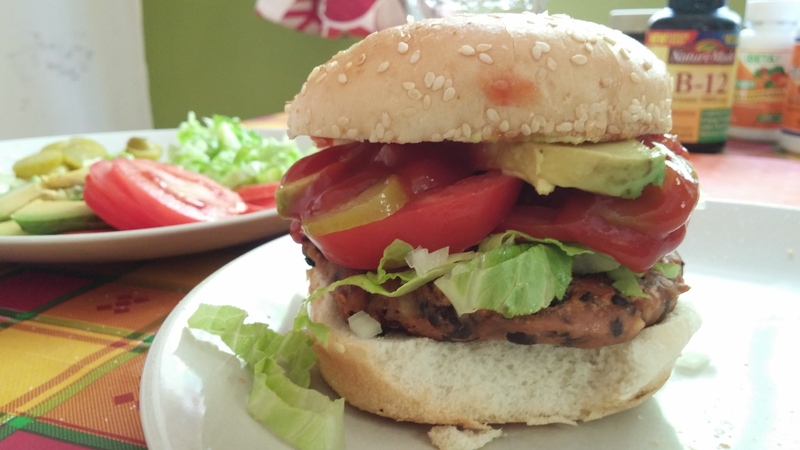 They are also really easy to make and even though they are made with beans, they don’t have the overly healthy taste that you sometimes get in other veggie burgers. I go back and forth with using canned beans. On the one hand, all you have to do is open a can and they’re ready. Nothing speaks to me more that having food that is ready to use. On the other hand, there are some health concerns about using canned beans. Recently, I’ve been boiling up beans in a big pot and freezing them in portions that I need to make things like black bean burgers. I am very fortunate to have a big deep freeze to keep it in. A lot of people are worried that beans can be gassy. You can keep the gas down by soaking the beans overnight before you cook them. I cook 1 part beans, three parts water, until they are nice and soft. Add water as needed and drain out any extra water that is left. It’s pretty simple, it just takes some time to do. And that’s why if I want burgers and don’t have any frozen, I’ll often go with canned beans. I like these burgers fried. If you want to put them on the grill, you can. Freeze them a bit and coat your grill with vegetable spray before you put them on. I wet my hands before I make the patties. It just makes it a lot easier and less messy to make them. I’m so glad you liked them. They are always a big hit at our house. I made these for lunch today. I was out of ketchup so used some picante sauce I had in the fridge. I reduced the amount to 1/2 cup rather than 2/3 cup since the picante is more liquid. They were wonderful! So quick and so few ingredients! My kind of recipe. all the stuff you find on most tables these days. Coming up with that using vegan ingredients means all new recipes! Yikes. That’s why I love your blog!